I go through these phases of voluntary solitary confinement every few years, the last one being when I was doing my A levels. I had gone the entire summer holiday between AS and A2 not calling a single friend, read an average of 20 books a week, watched SO much tv, and spent most of those three months cooped up in my room, playing on SnitchSeeker. That was a bit drastic, and yet, when the semester began, I just picked up where I left off with my friends (them knowing me far too well) and re-entered “reality”. My preferred form of socialising these days are confined to places where I can hear my friends speak so that I may actually have quality time with them, where the lights are steady and do not come with a disclaimer for causing epileptic shock, and where I can be home with enough time to still have a conversation with my family before I start getting ready for bed. I think it’s just a side-effect of growing older. Meh. Anyway, despite all this, I was quite looking forward to catching up with some friends and colleagues at a Bistro in town last night. Had even washed my hair, applied concealer and blush, and put on a fresh outfit! But my dad called, saying him and mum had to go for some networking thing, and needed me to pick up my siblings and grandma at my aunt’s in town. Now… I’m not one to say no to my father, even though I explained to him that I had made plans, and that these instructions would disrupt everything. We tried to find an alternative, but in the end, suffice to say, I scrubbed my face clean and changed into PJs. 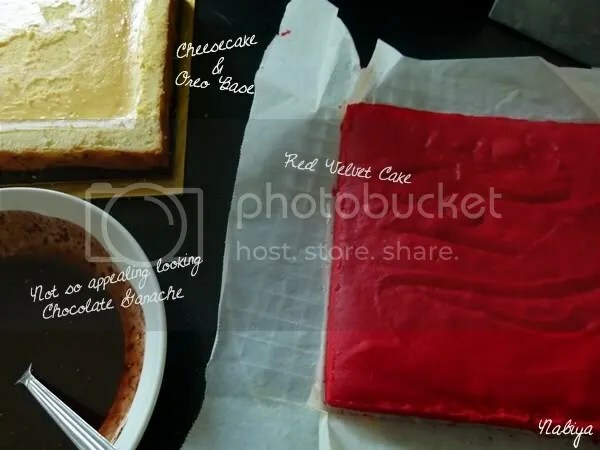 To then soothe my grumpy mood at having one of my rare nights out disrupted, I decided to attempt this recipe that I have been dying to try for a few weeks now. 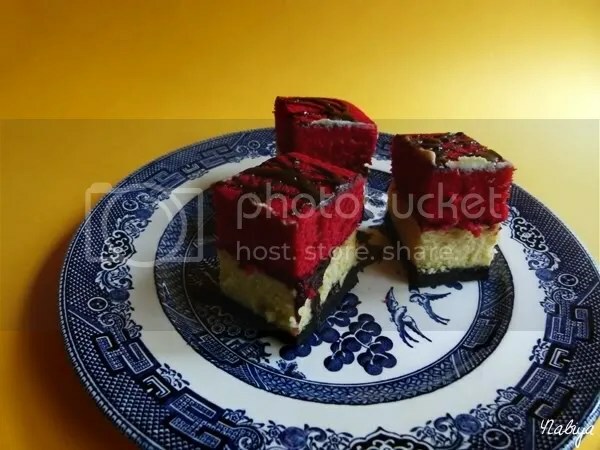 I had initially planned on baking it as a round cake for my parents on Valentine’s Day, but that didn’t happen, so this time I decided to bake it in a square pan… as I liked the cheesecake bar concept I did for the Berry Cheesecake Bars previously. So for those of you who are staying in this weekend, why don’t you try this recipe out and see if it helps to improve your mood as much as it did with me? The biscuit base, ganache layer, and cheesecake should already be in one pan. 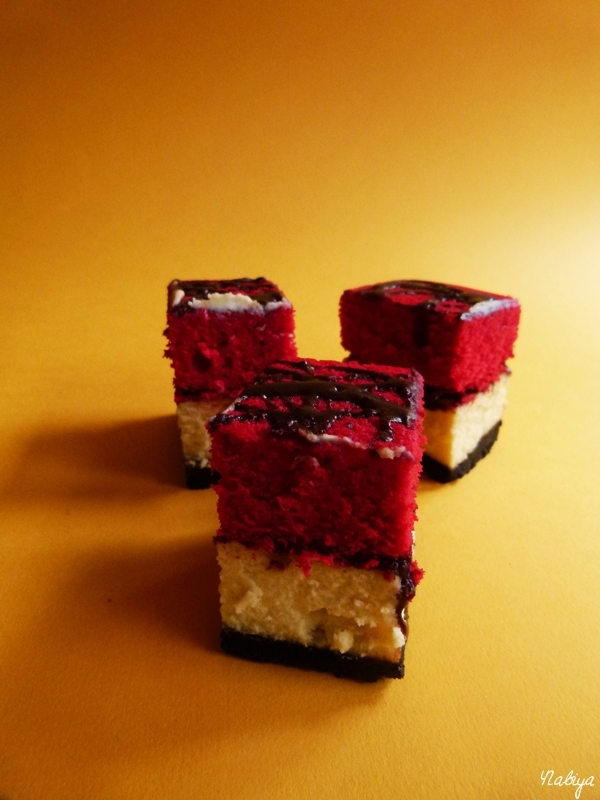 Carefully remove from the pan, and place on a cake board or serving platter. 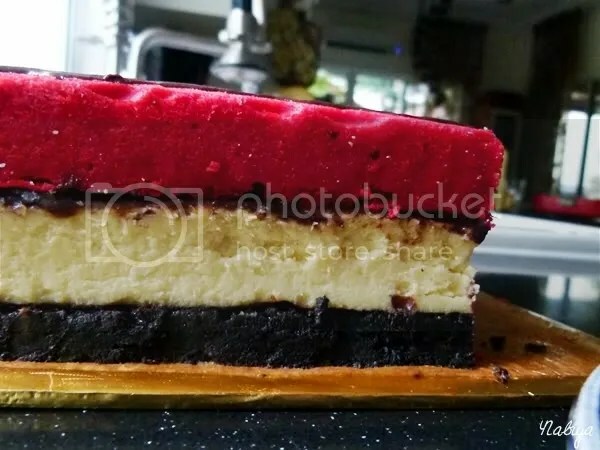 Apply another layer of chocolate ganache over the top of the cheesecake, then place the red velvet cake top-side-down on top of the cheesecake. Cut with a long serrated knife as necessary to ensure the sides match up. I didn’t add too much ganache or cream cheese frosting (as indicated in Willow Bird Baking’s recipe) as this cake is far too rich on its own. But that’s your prerogative!